Pergo XP Burnished Caramel Oak showcases a fashionable European design enhanced by a beautiful caramel color with golden undertones. The wide planks are finished with a burnishing treatment adding definition to each edge. The patented Uniclic joint technology makes installation quick and easy, providing a secure fit. With PermaMax surface protection, Pergo XP offers double the wear and double the durability versus ordinary laminates. The limited lifetime residential and 5-year light commercial warranty, guarantees the top layer against wear through, staining or fading. Made with materials from North America and Europe. Wear claim compared to standard AC3 laminate flooring and measured in accordance with NALFA/ANSI LF-01-2011 and/or EN13329:2006+A1:2008. California residents: See proposition 65 information. 22.09 sq. ft. per case. Case quantity: 9. Case weight: 33.6 lbs. Buy online Pergo XP Burnished Caramel Oak 8 mm Thick x 7-1/2 in. Wide x 47-1/4 in. 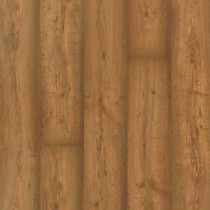 Length Laminate Flooring (22.09 sq. ft. / case) LF000846, leave review and share Your friends.